Mophie is an external battery hidden inside a protective form-fitting case for the iPhone. 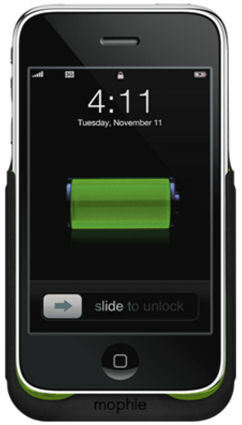 The rechargeable Mophie ‘Juice Pack 3G’ is designed to more than double the time you can use your iPhone 3G. If you switched from the iPhone 2G to the iPhone 3G, the immediate disappointment was the short battery life. Forget about playing games or listening to your iTunes, just making it through the day without a recharge seemed to be an impossible dream. 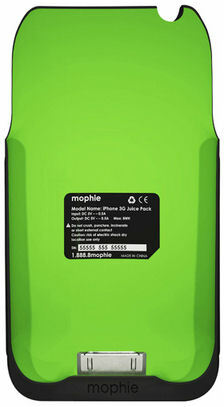 Mophie has changed all that with the new Mophie ‘Juice Pack Air’ 3G. It offers the safeguards of a hard-shell case while providing twice the battery life of the iPhone, together with a sleek, lightweight design. Mophie is the first, as well as the world’s thinnest, Apple certified “Works With iPhone 3G” external battery in the world! The Juice Pack 3G is a rechargeable 1300mAh lithium polymer battery specifically designed for the iPhone 3G and has passed the strict over-the-air performance tests by an Apple designated test lab. Using only Apple certified connectors, the Mophie Juice Pack 3G has been officially certified by Apple Inc. as a “Work with iPhone 3G” product, ensuring it’s 100% compatibility with your iPhone 3G.